HESS J1857+026 - another VHE gamma-ray source demystified? 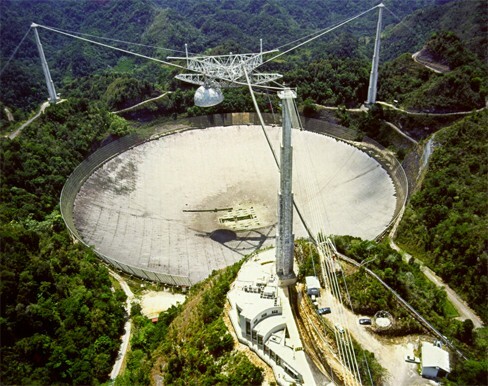 The 305-m Arecibo radio telescope in Puerto Rico is used in the PALFA pulsar survey which led to the discovery of the pulsar PSR J1856+0245, co-located with the so far unidentified HESS gamma-ray source HESS J1857+026. The survey is carried out using Arecibo L-band Feed Array (ALFA), a seven feed system for large-scale surveys of the sky. Image source: NAIC. The H.E.S.S. Galactic Plane Survey (Aharonian et al. 2005, 2006, 2008, SOM 12/07) resulted in the discovery of a number of gamma-ray sources without obvious counterparts in other wavelength regimes. 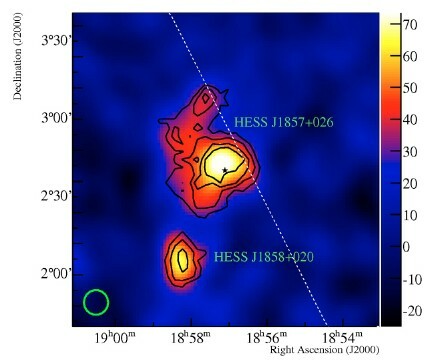 One recent example are the sources HESS J1857+026 and HESS J1858+020 (Fig.1), located close to each other near the Galactic plane. Both objects are extended gamma-ray sources. A view of the region in other wavelengths shows no plausible counterparts (Fig. 2); a pulsar with high spin-down energy loss and a supernova remnant are both too far away from the gamma-ray sources. This situation changed with the recent discovery by Hessels et al. (2008) of a new pulsar, PSR J1856+0245, by the PALFA survey, aiming to survey the Galaxy with improved sensitivity using the ALFA receiver at the giant Arecibo radio dish. 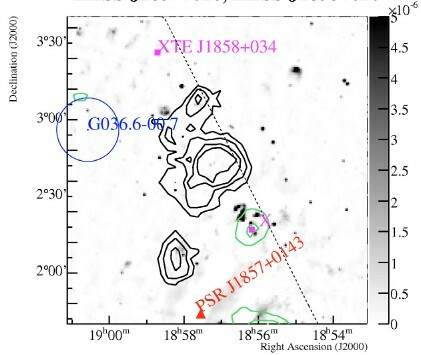 PSR J1856+0245 was first detected in a 268-s survey observation in April 2006. Timing observations with the Arecibo and Jodrell Bank radio telescopes determined, beyond the spin period of 81 ms, the spin-down energy loss of 4.6 x 1036 ergs/s and the characteristic age of 21000 years, and provided a distance estimate of about 9 kpc (Hessels et al. 2008). The pulsar is located within the gamma-ray source, slightly offset from its center (Fig. 3). Electrons accelerated near the pulsar are presumable responsible for gamma-ray production, converting about 3% of the pulsar's spin down energy loss into high energy gamma rays. In ASCA X-ray images, a possible X-ray pulsar wind nebula is seen at the location of the pulsar (Fig. 3); however, gamma-rays are a more sensitive diagnostic and track electrons streaming away from the pulsar out to distances of a fraction of a degree, equivalent to tens of parsecs. As more and more pulsar associations of very-high-energy gamma ray sources are discovered - see SOM 5/08 for another recent example - it is becoming evident that pulsars account for a large fraction of H.E.S.S. gamma-ray sources in our Galacy. Fig. 1: Gamma-ray image of HESS J1857+026 and HESS J1858+020. The dotted line indicates the Galactic plane. Fig. 2: View of the region around HESS J1857+026 in other wavelengths, as known at the time of discovery of the gamma-ray source: HESS significance contours (black) and adaptively smoothed ROSAT X-ray contours (green), overlaid on a NVSS radio image (grey-scale). Also shown are the positions of a known high spin-down flux pulsar (filled triangle), the supernova remnant G036.6-00.7 (circle), and the X-ray binary XTE J1858+034 (square). None of the objects qualifies as a plausible counterpart. Fig. 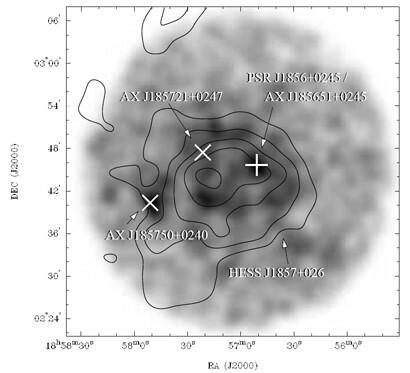 3: ASCA X-ray image of the HESS J1857+026 region (zoomed in compared to Fig. 2), with HESS significance contours (black lines) and the newly discovered pulsar PSR J1856+0245 marked with a plus sign. From Hessels et al, 2008.